Welcome to my newest monthly feature, the Real Food Recipe Roundup! Back when I did my readers survey, I learned that finding nourishing, whole food recipes is right up there among your favorite topics on this blog. I thought that it might serve you all if I shared some great recipes from around the web and blogosphere each month. I’m making a point of sharing recipes that are family friendly and simple, as well as nourishing, because I like to keep it simple in my own kitchen. I’m not a gourmet, but I do appreciate foods that taste wonderful, as well as nourish our bodies. To make the recipes even more useful to you, I’ve given some of my own feedback from trying the recipes (instead of just linking to them), which I hope you find helpful! If you have any recipes that you’d like me to try out and review, send them to my email (stephanie (at) keeperofthehome (dot) org) and if they’re something I think my family would eat, I’ll make a point of trying them and including them in my roundup if we enjoyed it! 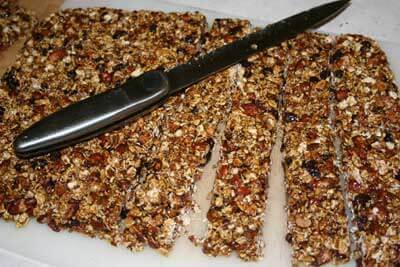 These granola bars received rave reviews in our home, and with some friends who tried them as well! They were the first granola bar recipe I’ve tried that really stayed together and didn’t crumble, a must with little ones who need snacks on the go. My husband thought they were incredible and I’ve been asked to make them again and again. I used almonds instead of peanuts, because that’s what I had on hand, but I’m sure they’d be great with peanuts as well (which I’m going to try next). I also had to use more Sucanat than honey, simply because I was running out of honey, and it still worked wonderfully. The only thing I don’t like is that it’s quite a process to make them: soak the oats/nuts/seeds, then dehydrate them all, then actually make the recipe. I think that I will soak and dehydrate large batches of the oats/nuts/seeds all at once, and then keep the extra ones stored away so that I can very quickly make a new batch when I want to. These are my most standard muffin recipe. They are so quick and simple to make, starting them in the blender before bed and finishing them up in the morning. I always make a double batch (though you need a pretty big blender to do so- I have a Vitamix). I like to add things like blueberries, raspberries, different kinds of nuts, etc. My recent favorite variation is to use frozen cranberries (which I bought on a smoking sale after Thanksgiving and just washed/froze for baking). The cranberries have a perfect tart flavor that complements the simple sweetness of the muffins. It’s also really nice with just a little streusel (unrefined sugar/cinnamon) sprinkled on the top before baking. This is my new standard granola recipe. It’s delicious with either just raw milk or with yogurt and berries. Such a nice, quick breakfast for busy mornings! Even though it’s a soaked recipe, it comes together really easily. It takes about 5 minutes to start it the first day, then another 10 to get it mixed up and onto trays for drying, then another 5-10 to mix it up with all the goodies and put it in bags/jars. I just use bits of time that I have in the kitchen in between other tasks and it feels like a cinch to make. I don’t like using so much maple syrup (because of the cost) so I substitute some Sucanat in and then just add a bit of extra liquid. For nuts/seeds, we really like using chopped (lightly roasted) almonds, and this time I’m going to try cashews for a change. I always add sunflower and pumpkin seeds, as well as sesame and flax seeds. Raisins are a must, and I tried dried cranberries last time which were great as well (have never tried the figs). One little trick I discovered recently is that the easiest way to break it all up once it’s dry and ready to be stored is to take chunks of it and process them for a few seconds in the food processor. It gets it to a perfect texture in no time at all, saving me from having to break it all up with my fingers. Having trouble getting greens into your kids (or husband)? Try this casserole! It’s easy to whip up, and very tasty. My family really enjoys it. It makes a great side dish served alongside fish, especially (or so I think). I’ve also tried using fresh kale instead of the spinach and it was good, just use a bit less kale because it has a stronger flavor. Frozen spinach works fine, too, and I’ve made this using the chopped spinach I froze from my garden this summer. What can I say but yum? The sauce turned out so nicely. Definitely do these on low temp, so they have time to simmer and really get tender (esp. if you’re using grass fed ribs). These made for such an easy but special dinner! My own simple recipe that has become a new favorite. Here’s how to do it: Dice several large beets (or quite a few smaller ones) in one inch cubes (approx. ), toss in a baking pan with a bit of extra virgin olive oil and sea salt. Bake at 350 for 45 min, stirring once. Amazing! If you’ve never been a beet fan before, you need to give this recipe a try because it has converted my entire family, myself included. Now, I buy beets almost every time I’m at the market! It’s seasonal for winter and so very nutritious. Seriously, I know you think you don’t like beets, but promise me you’ll try, ok? Have you seen any of the $1 Healthy Menu recipes over at The Nourishing Gourmet? Gingered Sweet Potatoes, Turnip and Squash Gratin and more… has anyone tried any of them yet? They’ll find a place in my January menus! What recipes has your family been loving lately? This has been added to our menu several times, the whole family loves to eat these. I love that it is a frugal recipe and can substitute zucchini if I am low on carrots. Also rice and lentil casserole is a budget saver! Very good! I was wondering if you had any ideas for breakfasts that are high in protein but don’t involve eggs or milk? I used to love both of those items but can’t stand them right now in my pregnancy. (I’m 17 weeks and thought the morning sickness would be gone by now, but it’s not and those seem to be trigger foods). I’ve been eating toast but I really want to follow the Bradley diet and I’ll never make to 80 grams of protein without a good start to the day. .-= MacKenzie´s last blog ..Christmas Song Ponderings =-. @MacKenzie, What about something with nuts and seeds? You can do a smoothie based on a “nut-milk” (soaked nights blended with water), with fresh or frozen fruit. Trail mix is good. If you can handle any yogurt at all, you could add nuts to that. Or, what about breakfast meats? Nitrate-free sausages or bacon, or even just leftover chicken/beef, etc. You could also just eat regular foods at breakfast. Soup could even be nice, something hearty with beans, lentils or some kind of meat. Hope the morning sickness gets better soon! We love the spinach rice casserole too! I like serving it with salmon. Thanks so much for the awesome recipe roundup! 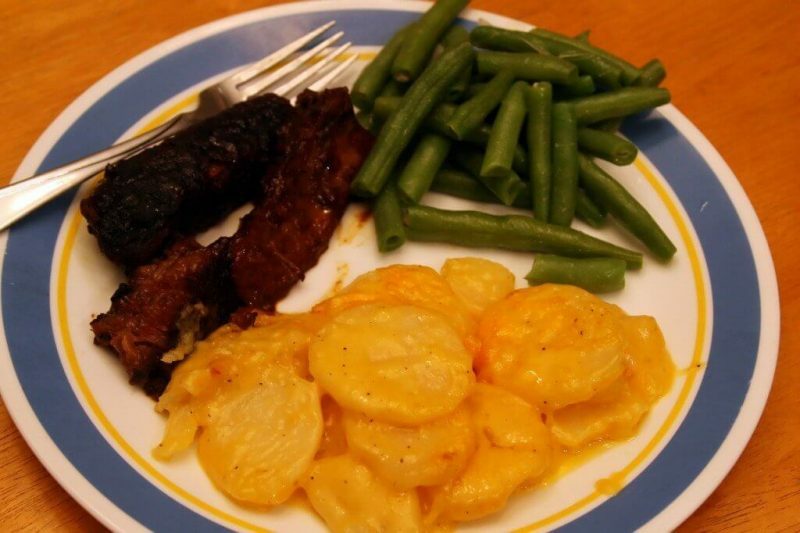 I can’t wait to try the spinach and rice casserole, tomato soup and BBQ ribs. Everything looks so yummy! We had this just last night and it was very good, it got 10 thumbs up from all of our family. .-= Sandy @ The Mommys Place´s last blog ..Homeschool Library Trip =-. I’m fairly new to the “nourishing food” scene (though, we’ve always tried to be “healthy” we used to think that just meant low fat and whole grains), so I always need good recipes. To have your input with them is even more valuable! I can just scan through what you thought and be able to tell if my family will like it or if I have the equipment I’ll need (no dehydrator). .-= Candace @ A Worker at Home´s last blog ..Grateful – #1202 =-. @Candace @ A Worker at Home, I’m glad this is helpful for you! You mentioned dehydrator so I wanted to say that the granola doesn’t require one. You can use one and it works well, but I’ve also made mine in the oven on the low temperature several times and that worked just fine as well! .-= Kate´s last blog ..Ways to Save Money Around the House =-. This info looks amazing, Stephanie–but it is also a long post and seems like it would have taken a lot of time to prepare! Yesterday you were talking about scaling way back, and today you’re launching a new monthly feature?! I LOVE, love, love reading here–just want to make sure you’re taking care of YOU! .-= steadymom´s last blog ..My New Priority: Moms’ 30-Minute Blog Challenge =-. @steadymom, Thanks for the concern, Jamie! Actually, this post was easy to write because it’s a bit more stream-of-consciousness than many of the posts that I write. I did it in less time than a lot of other posts and finished blog work easily by the time I wanted to be finished. If I hadn’t, the post would have waited for another day. And the reason I’m happy to do this monthly is because it truly is an easy post for me to put together (and something people want to see- a double bonus)! 🙂 But please, keep me accountable! Are the granola bars crunchy or chewy? My kids would love the chewy ones…. .-= Michelle´s last blog ..Recycled Post: What Does SAHM Look LIke On Your Resume? =-. @Michelle, They’re more towards the chewy end. Because you bring the butter/sugars to the soft candy stage, they’re sort of like a chewy taffy kind of texture. I’m interested in making the granola bars. But when it comes to soaking the grains, and then dehydrating them, I don’t have a dehydrator. Can you dry out the oatmeal on low heat in the oven? Just wondering. Thanks. @Jessica, Yes, I think you probably could. But try to keep it really low because if you cook them too much, they will get hard and dried out and then your granola bars won’t be as nice and chewy. Thank you for all of these yummy sounding recipes! I love reading your site! I had a question about the blender muffins. Do you put the whole grains in the blender (not the milled flour)? The recipe sounds really easy, I was just a little confused about that part. @Carolyn, Yes, it’s the whole grains, not the flour. You can also make the recipe by using flour (but the amounts change) and mixing it in a bowl. Since I already grind my own flour, it’s easiest for me to use the grains in the blender. Thank you…I also grind my own flour and have the grains so it seems extra simple! It just seemed different to see a muffin recipe that didn’t include flour….